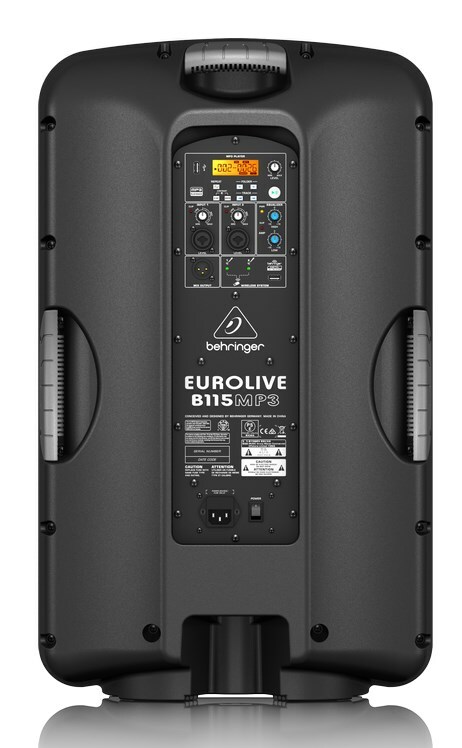 The EUROLIVE B115MP3 active loudspeaker is exactly what you’ve come to expect from BEHRINGER – more power, more features and absolutely more affordable! Our engineers have really outdone themselves, creating a self-contained PA solution that merges state-of-the-art, 1000-Watt Class-D power amp technology with an integrated 2-channel mixer, built-in wireless microphone capability, a high performance MP3 player and exceptional portability. Then we loaded the B115MP3 with our best 15" long-excursion driver for incredibly deep bass, and a state-of-the-art 1" phenolic-diaphragm compression driver for exceptional high-frequency reproduction. The B115MP3 professional active loudspeaker is destined to become a legends in its own right, alongside the other EUROLIVE models that have made BEHRINGER the world leader in active loudspeakers. We drew from our considerable experience to build this performance-grade loudspeakers, made them lighter (38.9 lbs/17.7 kg) – and more powerful. With custom-engineered Class-D power amps for the ultimate in power and efficiency, backed by SMPS (Switch Mode Power Supply) technology – the high-tech alternative to heavy transformers and massive heat sinks – your B115MP3 loudspeaker can run cool all day and all night without even breaking a sweat – or your back! One of the coolest features on this loudspeaker is the fully addressable, embedded MP3 player. The 8-button user interface and high-contrast, multi-function LCD panel let you instantly browse tracks and enable shuffle, repeat or single-play modes. From break and background music to high-resolution performance tracks, this full-feature MP3 player can handle it all. Cut the Fat; Keep the Beef - We drew from our considerable experience to build these performance-grade loudspeakers and made them lighter (B115MP3: 38.9 lbs./17.7 kg; B112MP3: 27.6 lbs./12.5 kg) and more powerful. We started with custom-engineered Class-D power amps for the ultimate in low-distortion power and efficiency. Backed by SMPS (Switch Mode Power Supply) technology, the high-tech alternative to heavy transformers and massive heat sinks, these loudspeakers can run cool all day and all night without even breaking a sweat! Onboard MP3 Player - One of the coolest features on these loudspeakers is their fully addressable, embedded MP3 player. The 8-button user interface and high-contrast, multi-function LCD panel let you instantly browse tracks and enable shuffle, repeat or single-play modes. From break and background music to high-resolution performance tracks, this full-feature MP3 player can handle it all. Wireless Wonderland - Until now, adding wireless microphones to a PA system meant either a mess of wires and dangling receivers or worse, a built-in receiver with dodgy performance and a hefty price tag. Those days are officially over thanks to BEHRINGER ULTRALINK Series wireless mics that feature our exclusive, ultra-compact 2-channel receiver. Just plug the receiver into the dedicated wireless port on the rear panel and you have full access to two channels of supremely stable, natural-sounding wireless connectivity. Sold separately and available in hand-held or headset models, BEHRINGER ULTRALINK Series wireless mics will immediately (and inexpensively) expand your B115MP3/B112MP3 to handle virtually any live sound application. Built-in Mixing Capability - The integrated mixer features the same ultra low-noise, high-headroom mic preamps that have made BEHRINGER mixers legendary, and the two inputs accept virtually any mic/line level signal you're likely to run across. Variable Input gain controls (with Clip LED) will have you dialing in the perfect level every time. Just plug in a mic, along with a guitar/piano, connect your backing tracks via USB stick and let the show begin. And if you need more coverage, use the convenient Link Output XLR connector to add more active loudspeakers. Power and Control - There is absolutely no substitute for amplifier power in high-performance loudspeakers; the kind of power it takes to deliver clean, in-your-face vocals and chest-thumping bass day in and day out. That's why we gave these bad boys 1000-Watts of bi-amplified, digitally processed output power. But with great power comes great responsibility, so our engineers included a proprietary DSP (Digital Signal Processor) with high-end features such as a dual-band EQ, an active crossover, dual protection limiters and transducer response correction, ensuring these loudspeakers deliver incredible output at the lowest possible distortion levels. Custom-Engineered Transducers - Powerful, high-efficiency Class-D amplifiers and Switch Mode Power Supply technology coupled with state-of-the-art DSP functionality sure sounds impressive- but what about the part of the system you actually hear? We never cut corners on our transducers (woofers and tweeters), and we never just pull what we have off the shelf. Our LF (Low Frequency) and HF (High Frequency) transducers are designed specifically for each application-it's what sets us apart from the competition. 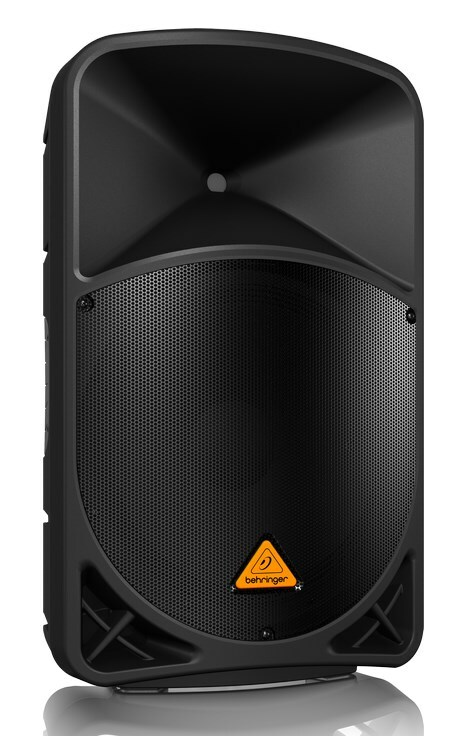 When you buy a BEHRINGER active loudspeaker, you can rest assured that the transducers inside have been engineered to perform flawlessly in conjunction with every other element for truly professional results. B115MP3 and B112MP3 active speaker systems crank out massive quantities of low end, with articulate, detailed mids and crystal-clear highs. Extraordinarily Versatile - Thanks to its trapezoidal shape, the B115MP3 and B112MP3 are suitable for a wide variety of applications. They can be mounted on standard speaker poles, placed vertically atop subwoofers, or even laid on their side for use as onstage monitor wedges. Their extraordinary fidelity and frequency response make them a favorite of vocalists and instrumentalists alike. Hook up is simple, requiring only a single XLR or 1/4" cable from your mixing console and power. Additional monitors can be chained together via the XLR Link Output jack on the rear panel.